WE MANUFACTURE AND SUPPLY ALL TYPES OF INDUSTRIAL FURNACES,LAB GRADE FURNACES,SILICON CARBIDE HEATING ELEMENTS.SEALED QUENCH FURNACE HEATING ELEMENTS,TEMPERING FURNACE HEATING ELEMENTS,ANNEALING FURNACE HEATING ELEMENTS,OVENS HEATING ELEMENTS,SPARES AND ALLIED EQUIPMENT. 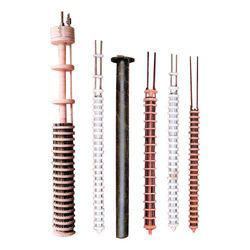 We are a leading manufacturer & supplier of Furnace Heating Element. Looking for Heating Elements,Sealed Quench Elements,Tempering Elements ?